Back in the 1800’s and early into the 1900’s, it was not unusual for a pastor/preacher to be itinerant. Itinerant meant that they either lived in one city and did ministry in another or they were a circuit preacher preaching in numerous churches on a rotational cycle. With so many churches being extremely small and unable to afford a pastor all their own, sharing was a must. 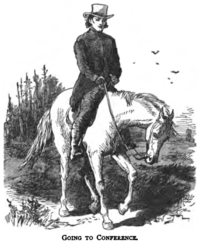 So the itinerant pastor traveled between locations, most often by horse and much later by car. So far in my ministry life, I have been far more of an itinerant pastor/preacher than anything else. I have been on 6 church staffs in KY & TX, in nearly every position except Senior Pastor (i.e., Youth Minister, Associate Pastor and Interim Pastor) and in only one of those positions did I live in the actual city of the church. Here’s the list and the drive time, one-way, to church. Main Street Baptist Church, (full-time staff) Alexandria, KY – we lived in Alex. Itinerant ministry can provide some benefits and challenges. – First, there can be a benefit to having some space between you and your people. Especially in the smaller community, pastors can feel as if they are always “on” whether at a restaurant, the grocery store or even driving from place to place. Over time, this amplifies the glass-house syndrome. – Secondly, itinerant ministry demands the pastor/minister and the church select only the most important of ministry tasks. When you don’t live in the city, you have to come and go, which demands everyone to be selective and prioritize what is going to happen and what is going to be dismissed. – No question, relationships. It is possible to build great relationships in itinerant ministry, but they will not be as strong as other types of connection. It is hard for the people to ever view you as an insider and local, if you live 45 minutes away.